Still room for improvement, but much better. To tell the truth, I don’t like doing alterations because I always make a better garment if I can get all the fitting changes made either at the tissue stage or the fitting stage. Somehow ripping open seams, cutting, trimming, restitching never works as well for me. As always YMMV. Hmm, time to get a hair cut, cause those 2 are ready for fall wearing. Wish I could say I’d taken a spectacular vacation or something since the last time I posted, but, no it’s been life as usual. I’ve had a few *bad nights, but mostly it’s just stuff that needs to be done that has eaten up my time. I cleaned out the Sewing Room Closet, as much as can be done. It is also my off-season storage so there are clothes hanging and boxed year-round. It had a few UFO’s most notably the various unfinished pairs of 3418 pants. (That’s a big fat fail for me.) Those pants are destined to be next winter’s pj’s and have been boxed with the rest of the winter clothes. The only projects now hanging in the closet are the drapery fabric for the living room and the summer bathrobe to be completed shortly. IOW the Sewing Room closet is now devoid of everything except the winter coats in storage and the current projects. Yeah!!! Believe me, I’ve worn worse. So have you (don’t try to tell me you haven’t slept in your husband’s ratty T-shirts.) However, first on my sewing list are new summer pj’s. With that, let the sewing commence. which I posted on November 18. I just could not become comfortable but again, I love the fabric. I know that from time to time I try to make tunic length blouses and I’m never happy with them. I didn’t intend for this upcycle to be a tunic, but I think that’s the basic issue. Well, the flash of white I kept seeing didn’t make it any better. It took only a few moments to trim away the lace; it was cheap lace from Walmart so I didn’t bother to rip. I measured the length from shoulder/neck to raw edge hem. 26.5″ No wonder I was unhappy. I cut my blouses 25″ long and hem them 1.25″. Along with a 3/8″ shoulder seam allowance that means my preferred finished length is about 23.5″. So next step was trimming away at the raw edge to produce my preferred 25″. Followed by turning up and stitching a 1.25″ hem. Result: Happiness! And yes it is the RBA responsible for most of these drag lines especially the drag lines from the bust. I think that is so odd. Can understand totally if you strongly disagree that the RBA is responsible for the bust lines. All I can say is, when I make the RBA, they disappear. Swear. Neckline package for more variations. and Tabula Rasa Vest (TRV) with other variations possible. 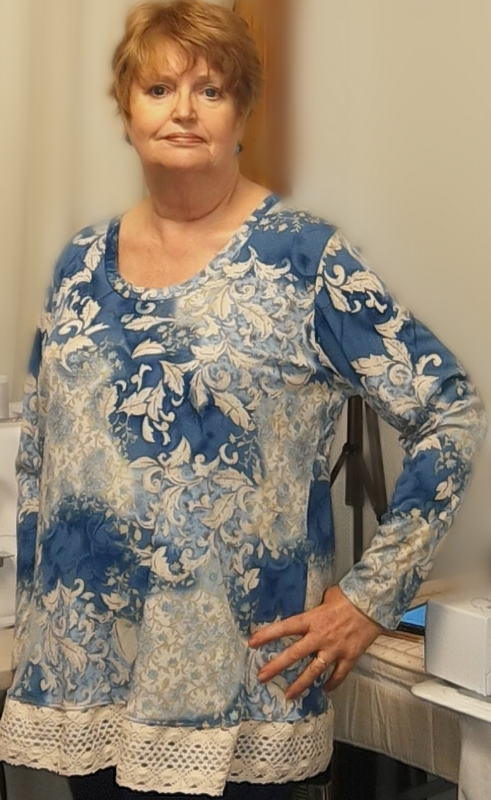 Between the two patterns TRT and TRJ I have over 20 patterns/styles if I count the easy switch between swing or straight and vest or sleeveless blouse. I’m getting a lot of mileage from these two patterns and have to say they were well worth my $$$. B0456 which I can make about 3 variations more if I include adding collars, changing hems and shoulder lines. B6299 which will be overworked. It offers armscye princess seams in an empire style with either pleated or tailored ‘skirt’. It is dress-length which I’ve already made blouse length and am planning maxi length. I’ve also converted it from 8 pieces to 4 pieces. It is such a basic pattern I expect to graft many sleeve and neckline variations. Iit was drafted for wovens , I accidentally converted it for knits — unlike the Fit For Art patterns for which I purchased separate knit (TRT) and woven (TRJ) drafts. (PS there is quite a bit of difference between the two drafts.) I’ve lost count of the possible versions for B6299. Trudy Jansens 906 for which I already have multiple variations including a yoga and a DG2 Faux Jean; and it converts from woven to knit fabrics with a simple increase of seam allowances. 2nd pants pattern is Jalie’s Eleanor although I seem to need to tweak it a bit. It is excellent for knits especially those slinky numbers. My 3rd layers are all courtesy of Walmart. There aren’t pattern pictures because I simply measured and stitched by examining my original purchase. I don’t include some of my recent successful sews as TNTs. For example Bog Coat and variations are not really TNT yet. I haven’t been able to eliminate the U’s along the side because I can’t figure out how to add an RBA. I’m not counting Burda #124 2009-03 because I replaced it with B6299. I’m not counting my Silhouette Patterns. I think I’ve fit them, but faill when trying to use a good fabric . Also not sure I will continue working with the Silhouette Patterns I own because I’ve discovered that I need lots of seams or darts. I’m unsure about my slopers. I keep tweaking them. Again I think they are fine. I think I’ ‘ve tweaked and fit my slopers but the next time I go to use them, I have to pinch at the bust or armscyes or add CF length or or… Well, something’s not right. I think I need more seams and darts even in my slopers. I need places that can be changed at the pattern level. Yes I can pinch and dart wherever I’m having issues but when I transfer that to the tissue the problem reappears. I can’t move the change or eliminate it. It seems as though I am round where I am round. I am short where I am short. Tweaking the tissue doesn’t seem to work. Adjusting the fabric in the exact spot needs to take place. For example, the plain old T. I can pinch a bust dart and eliminate the drape lines in a test garment. I can move that dart to the hem on the pattern, as recommended by fitters and drafters alike. The next time I use the altered T pattern, the drape lines will return. Why? Because the fabric always wins. Because the fabric needs to be shortened or darted to mold to my curves where my curves are. I’m really happy to have this range of TNT’s. However I’m a curious person and already considering working with other patterns. I’m looking for patterns with more seams, especially seams that bisect the armscye. So I’m looking for princess like seams and yokes. I may try a shoulder princess at least twice. Once to see if I can fit and the second time to see if the changes work when transferred to the tissue. I remarked at the end of my raglan escapade that I might take that up again. I’ve already ordered a Silhouette pattern which has additional seams besides the raglan. Plan to try it at least twice as well. I searched through my patterns including Burda and Otto magazines and found at least 40 with armscye princess seams another 23 with yokes and an interesting 17 with odd seams that are a cross between armscye princess and a yoke. And that’s not all. I’ve been avoiding the stripes in my fabric collection . I thought were random some of my print fabrics where random. . But when spread out on my 2″ cutting board, the pattern forms stripes. There are many that form diagonal and subtle stripes as well . I’ve been avoiding these fabrics until I create TNT’s. I’m afraid I will make wonky instead of neat or inspired stripes if I have to tweak and dart the fabric for fit. No doubt these will keep me busy for a while. I have a huge pattern collection that I’m wondering if I’ll ever use again. I don’t expect to lose weight or stand straighter. It’s the age thing. I earned not only the wrinkles but all my figure variations through the life I’ve lived. Earned and owned. I’m wondering, especially since I could use the space, should I keep all those patterns and hope someday to get smarter and be able to use them or should I discard them now? What would you do with patterns you’re pretty sure you’ll never use/use again? Keep? Discard? Donate? Like with my previous Bog Coat, I decided to create a pattern for future use. I know that I periodically use this style. A pattern will allow me to repeat exactly or to make changes based on experience rather than guessing.For the ‘skirt’ piece, I started with a rectangle 18″ tall and 26″ wide. Then I sloped from side seam to CB which added 1″ length (total 19″) at CB. This is a half piece consisting of 1 front joined to half the back; back will be placed on a fold to create the full ‘skirt’ piece. I reshaped the neckline to a rounded V. It’s my most flattering shape. I love that in a jacket/3rd Layer I can bring the point of the V down so low. The upper bodice is 20″ wide and 31″ long. My pattern includes the cuff. Granted, most fabrics will not be wide enough. I will either place the pattern piece lengthwise/on grain or fold up the cuff and cut them separately. Now someone is thinking this is not really a Bog Coat and you are right. The classic Bog Coat is 1 piece with a few slashes to define sleeves and center front. The classic is very fabric conserving and among the least wasteful of fabric. I relate this to the Bog because of it’s over all shape and again the clever folding. I could sew the center back of the skirt to the back of the upper bodice and then sew the side seams and sleeves as is done with the Bog. However, I stitched the underarm/sleeve seams first, then joined the upper bodice and skirt with one long seam. Either stitching method is acceptable. Even if it is not, it is my garment and I’m going to sew it the way I want. Before cutting I made a second evaluation of the fabric, layout and stretch. I did not want the stripes to run horizontally across my body. I’m curvy and stripes not only follow the curve but emphasize any curvature. But I was more concerned about my shoulders than my middle. I could just imagine the stripes making me look like a TeePee. Not the look I was going for. So I laid out my pattern on-grain but then it occurred to me that the fabric stretch was going to make this grow. How much? The rule of thumb I got from experienced knitters is about 1″ per foot of length. I put two3/8″ tucks in both parts of the bodice removing 3″ length and it wasn’t a bit too much. Remember this is a rib-knit with 100% stretch. Before hemming and finishing, I slipped on my new cardigan (it’s a knit). That’s when I discovered I could have removed even more length. I was happy that the hem was fairly level. I’m giving it the benefit of the doubt because I nearly always need to rotate my pics. I can introduce error in that process. Also, it seems to me that cardigans tend to droop at center front. I remember from my study of Elizabeth Zimmerman’s Knitting From The Top, that she recommended picking up a few less stitches along the center front bands to counter-act that natural tendency of knit fabrics. So I agree, that’s not a perfectly level hem but I didn’t take my scissors to it like I did with Bog1. I turned the cuff up 1 color (about 7/8″) and top stitched. At this point, I was once again faced with the fact I had planned and designed a plain, dull, uninteresting garment. Sigh, which is what I thought I wanted. However, I couldn’t stand another such blaaaaaaaaaah. I cut 3.5″ fring along the hem. Added a band to the front and fringed it 2″. Which is why I needed the beads. I needed to be able to find the ties quickly. Beads that weight the ties are useful for that. I’m surprised that I need only a 5/8″ RBA for blouse patterns. Any more than that introduces wrinkles and strangely makes the back peek up over the shoulder. So surprised I need 5/8″ on tops, but 1″ was not sufficient. Even in this pic the hem is not perfectly level. Could still be error caused by rotating the pic. More importantly are the drag lines from bust to side and not clearly visible above, repeated on the back. The empire seam keeps them from repeating all the way down and forming into V’s. Especially puzzling because I’ve never seen this on my other Bog coats including the one made 4 years ago and still in my closet. Dressmaking is really challenging. You can do the same thing time and time to different fabrics and one day it doesn’t work. Nonetheless, this garment is going in my closet. I need it. It is simple enough to work with all my garments but interesting enough to satisfy my need for embellishment. Like the black (which I wanted to be grey), fabric for a tan/brown 3rd layer is still on my shopping list. Sooner or later, I will be able to replace my cardigan with something I like even better.